U.S. Naval Research Laboratory (NRL) research physicists and engineers from the Plasma Physics Division, working at the High-frequency Active Auroral Research Program (HAARP) transmitter facility, Gakona, Alaska, successfully produced a sustained high density plasma cloud in Earth's upper atmosphere. As we can see, this is not conspiracy theory, pseudo-science, or Photoshop, as Dutchsinse's critics have claimed over the years. In the past, these critics have claimed that Dutch was photo-editing these formations into his videos. After this accusation failed to stick, they then moved to the claim that the formations were caused by "glitches". This claim fell flat as well. The critiques then moved to propose that each of the RADAR was “switching” between their clear air mode and precipitation mode. Again, this claim never stuck. 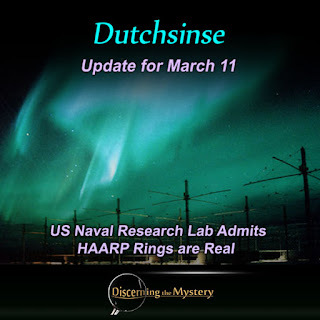 After all of these false excuses, the critiques simply chocked the HAARP-ring phenomenon down to "birds", "bugs", and "bats". In my experience, it is likely that many of these people were trained trolls, but I cannot know this for sure. What I do know is how satisfying it must be to hear the U.S. Navy finally tell the truth on the matter, and to put the blind nae-saying to rest (hopefully). With this scientific confirmation of the existence of this artificial atmospheric phenomenon, come many questions. Why were these actions taken without informing the public of what was taking place over our own heads? How much damage due to severe weather has been exasperated by the U.S. military's choice to play 'God' in this way? What types of risk have innocent citizens been exposed to without their knowledge? We don't have answers to these questions as of yet, but one things is for sure. The means of conduct of the Military Industrial Complex and Black Ops programs seem to be far removed from anything that comes close to respect for the rights of the people. As always, accountability is in order. Though the demand for this accountability cannot come from any outside source. It must come from us.